Several syndromes include headache, suboccipital pain as well as shoulder and neck pain. 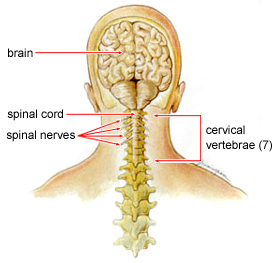 It is named cervical spondylosis if neck vertebrae are involved in the ailment. Lumber spondylosis is lower back spondylosis. Rough areas at the edges of bones may develop due to denerative changes which can cause irritation of nerves, muscles and ligaments. Cervical spondylosis can cause compression of spinal cord in the neck. It affects people who are middle-aged and is more common among people of age 55.It starts with osteoarthritis and then shows conditions of spondylosis cervical. Neck flexing in people with osteoarthritis causes severe cervical spondylosis pain. The spinal canal then becomes narrow, as the neck moves spinal cord injures.